In this episode, Hungry Vegan blogger and author Gail Davis shares her vegan transformation story, talks about her love affair with compassionate food, and demonstrates how to incorporate green cuisine into your busy lifestyle. And the family behind the Beanfields bean and rice chips company, talks to us about the role social responsibility plays in their family business, and how they came up with their award-winning vegan nacho chips. Gail Davis, otherwise known as Vegie Gail, is the author of So Now, What Do I Eat? and Vegetarian Food for Thought: Quotations and Inspirations. Her articles on delicious, healthful eating have been featured in scores of magazines including VegNews, Christina Cooks, and Body & Soul. She is also a speaker, nutritional consultant, and personal food coach, who has taught thousands of eager epicureans how to incorporate green cuisine into their busy lifestyles. Additionally she’s a food blogger and an artist. Gail shares her vegan transformation story, talks about her love affair with compassionate food, and demonstrates how to incorporate green cuisine into your busy lifestyle. You can find out more about Gail through her Hungry Vegan blog and her Vegan Culinary Creations (You Can Green Your Cuisine) website. We talk with Reed and Liza Braude-Glidden and Roy Glidden of Beanfields bean and rice chips. They tell us about their family, what role social responsibility plays in their family business, and how they came up with their Crispylicious! vegan chip products. Listen to learn how this “Vegan on Purpose” company came up with a cheesy tasting (but dairy free) award-winning Nacho chip, and why beans and non-GMO ingredients are showcased in their products. After a long hiatus, Nature’s General Store in Bend has re-opened their much loved juice bar and deli. Located in the back of the store, the order-at-the-counter deli features a menu full of vegan options. A large selection of raw, organically grown, and unpasteurized juices are available. Additionally, there are many lunch items that are clearly marked as Vegan, Vegan Option available, and Gluten Free Option. Menu items include the Falafel Wrap, Quesadilla, Treuben (which is a Tempeh Reuben), Tempuna Salad Wrap, and Teriyaki Veggie Wrap. A Vegan Egg Salad Sandwich is also available. A family owned and operated business, Nature’s keeps separate prep and cook areas for vegan deli items and stocks Daiya and Vegannaise for easy substitutions. In fact, they say they use Vegannaise for all of the sandwiches – vegan or not. Nature’s is located at 1900 NE 3rd Street, in the old Wagner Mall on the corner of 3rd & Revere. The deli is open 9a to 3p Monday through Friday. They hope to expand the days and hours soon. For more information, see shopnatures.com, Nature’s General Store on Facebook, or call 541-382-6732. For today’s Vegan Bite, we’re featuring a recipe from Vegie Gail, who we interviewed earlier in the show. 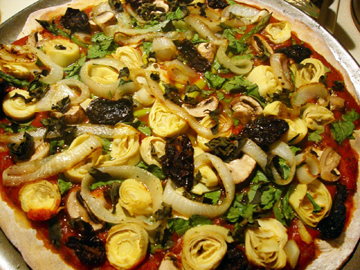 She’s created an Artichoke, Asparagus, Spinach, Sun-dried Tomato, Mushroom, and Onion Pizza which is colorful, tasty, and easy to put together. You can find cookbook reviews, contests, recipes, and more from Vegie Gail at hungryvegan.blogspot.com. VegNet Bend monthly meeting and potluck: 6p, May 23, The Environmental Center, 16 NW Kansas, Bend. Bring a vegan dish to share and your recipe and list of ingredients. Stay after the meal to watch a short cooking demonstration video by Julie Hasson, owner of Native Bowl in Portland, and author of Vegan Diner and 6 other books. Learn how to make some of Julie’s famous dishes, including Deli-style Vegan Noodle Soup, and the best and lightest vegan chocolate cake you’ve ever tasted. TrapFree Oregon will hold a public meeting May 24 at 6p at The Old Stone, 157 NW Franklin, in Bend. The new Executive Director will give a presentation on TrapFree Oregon’s progress.